The demand in the global blister packaging equipment market is projected to increment at a notable CAGR of 5.4% during the forecast period of 2017 to 2025, gaining traction from a number of factors such as growing need for intelligent modernization of manufacturing facilities to enhance production efficiency and reduce product changeover time, high degree of automation in the packaging line, and increasing adoption of blister equipment in production lines. 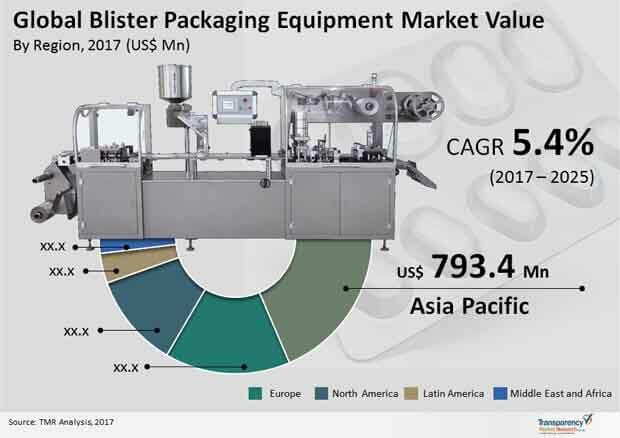 On the other hand, reluctance of the pharmaceutical industry to adopt new methods as they deal with sophisticated products, is hindering the ideal prosperity of the global blister packaging equipment market. Based on product type, the global blister packaging equipment market has been segmented into solid, semi-solid, and liquid. Globally, solid packaging equipment segment for blister packaging equipment dominates the market, with an estimated share of a little over 83%, by value. Solid products are easier to fill and more suitable than liquid and semi-solid products. Liquids and semi-solid products are preferred to be packaged in bottles and ampoules over blisters as minute leakage are probable due to shocks or load experienced by the blisters. By process type, automatic segment contributes with more than two third of market share by value, while the rest belongs to manual and semi-automatic. The increasing automation decreases the human involvement and also the skill requirement of the operator. This indirectly reduces the possibility of errors in manufacturing of blisters. On the basis of end-use industry, the blister packaging equipment market has been segmented into food industry, pharmaceutical, cosmetics & personal care, consumer electronics and other manufacturing. Among these, pharmaceutical segment is expected to dominate the market with around three fourth of market share by value. Based on equipment type, the inline filler equipment market is projected to register a solid CAGR of 5.6%, in terms of value, over the forecast period. By technology, the blister packaging equipment market has been classified into cold sealing, heat sealing, thermoforming, and ultrasonic sealing. Heat sealing can be further bifurcated into card-to-card, plastic-to-card and plastic-to-plastic. Currently, thermoforming category is dominating the global blister packaging equipment market with share of around half of the market, followed by heat sealing. Asia Pacific currently dominates the global blister packaging equipment market, both in terms of value and volume. In 2017, the Asia Pacific blister packaging equipment market was valued at US$793.4 mn. One of the major contributing factors for this, is growth in the demand of packaging in various application such as food, consumer goods, and pharmaceuticals, especially in the emerging economies, owing to shift in consumer preference towards convenience and aesthetic packaging. Europe and Asia Pacific are major producers of packaging machinery, particularly with countries like Italy, Germany, and Japan representing export of machinery globally. According to Italian Packaging Machinery Manufacturers Association, Italy and Germany account for nearly half of the automatic packaging machinery sold globally. This strong position of Italy can be attributed to several factors, such as high level of customization and high degree of competitiveness between small and medium sized manufacturers. Some of the key companies currently holding notable positions in the global blister packaging equipment market are Uhlmann Pac-Systeme GmbH & Co. KG, Bosch Packaging Technology, Sonoco Products Company, Marchesini Group S.p.A., IMA Industria Macchine Automatiche S.p.A., Körber AG, Fabrima Maquinas Automaticas Ltda, Gebo Cermex, Romaco Pharmatechnik GmbH, and CAM Packaging Solutions. Transparency Market Research examines the global blister packaging equipment market for the forecast period 2017-2025. The primary objective of the report is to identify opportunities in the market and present updates as well as insights pertaining to various segments of the global blister packaging equipment market. The report begins with an overview of the global blister packaging equipment market, evaluating market performance in terms of revenue, followed by TMR’s analysis of key trends, drivers and restraints witnessed in the global blister packaging equipment market. Impact analysis of key growth drivers and restraints based on the weighted average model is also included in the report. To compute the market size, in-depth secondary research is done. Data points such as regional splits and market split by product type, process type, equipment type, technology type, and end use type, have been assimilated to arrive at the market estimates. The report comprises the forecast of the global revenue generated by sales of blister packaging equipment market. TMR triangulates the data via different analysis based on supply side, demand side, as well as dynamics of blister packaging equipment market. TMR not only conducts forecasts in terms of value, but also evaluates the market on the basis of essential parameters, such as Year-on-Year (Y-o-Y) growth. This helps providers to recognize the future opportunities as well predictability of the market. Vital feature of this report is the analysis of the global blister packaging equipment market by product type, process type, equipment type, technology type, end use type, and region; and the corresponding revenue forecast in terms of absolute dollar opportunity. This is traditionally overlooked while forecasting the market. However, absolute dollar opportunity is critical in assessing the level of opportunity that a provider can look to achieve as well as to provide potential resources from sales perspective of the global blister packaging equipment market. In order to understand and assess opportunities in this market, the report is categorically divided into six key sections on the basis of product type, process type, equipment type, technology type, end use type, and region. The report analyses the global blister packaging equipment market in terms of value (US$ Mn) and volume (Mn Units). To understand key segments in terms of their growth and performance in the blister packaging equipment market, Transparency Market Research has developed a market attractive index. The resulting index should help providers identify existing market opportunities in the global blister packaging equipment market. In the final section of the report, Blister packaging equipment market competitive landscape has been included to provide a dashboard view of companies that manufacture and provide blister packaging equipment services. The report contains company profiles of some of the players in the blister packaging equipment market. Key players in the global blister packaging machines market include Marchesini Group S.p.A.. Bosch Packaging Technology, IMA Industria Macchine Automatiche S.p.A., Körber AG, Gebo Cermex, ULMA Packaging, S. Coop, Sonoco Products Company, Uhlmann Pac-Systeme GmbH & Co. KG, Romaco Pharmatechnik GmbH, Fabrima Maquinas Automaticas Ltda, Zed Industries Inc., Jornen Machinery Co., Ltd., Illig Maschinenbau GmbH & Co. KG, CAM Packaging Solutions, Starview Packaging Machinery, Inc., Royal Pharmaceutical Machinery Co., Ltd.